On Friday, I went to the mailbox, and found that V had ordered me a gift. It’s sterling silver, and V tells me that the beads are amber. Personally, that would be interesting, but that’s not what surprised me about his unexpected gift of jewelry to me: it’s the wolf that surprises me. 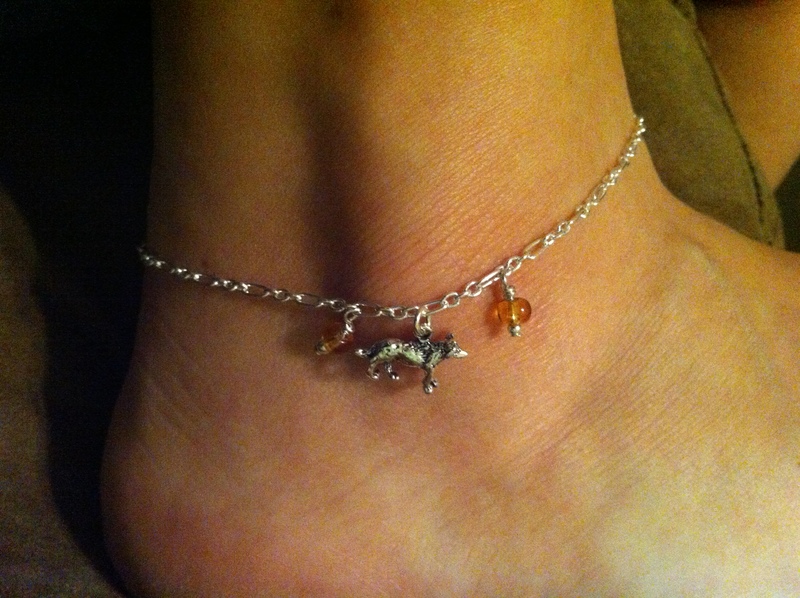 V said that other anklets had dolphin, flower, or bird charms, or, barring that — more beading — but that this one was the only one that had a wolf. And it was the last, perhaps, only one. So he bought it, and had it mailed to the house. So, I put it on, and I find that I can’t stop thinking about wolves, and especially about exactly why he’d been drawn to pick the wolf. I was puzzled and a bit surprised, because I don’t talk about wolves at all nearly as much as I’d talk about birds or horses…and yet, it’s not as if I don’t like wolves. I do. He couldn’t explain it either. He did admit on the Freyja note, that he did like — and thought that I would like –that it had amber. But that was secondary to his attraction to it. So, then I thought that he’d picked it because it was ‘different’ or ‘only’ or some such, but he did admit that the amber was the only thing that had any connection with his thoughts about my spirituality. So, not the wolf, the amber. But there were other ones with amber, he said. I then told him about Loki’s wife/consort, Angrboda – whom he admitted that he’d never heard of before — and I even showed him the simple (and I think I find somewhat oddly adorable) picture of Angrboda from K’s D’Aulaire’s Norse Myths, to help him out with a visualization of Her, but he shrugs. Does she have something to do with wolves? he asked. To which I replied, Well, They had a kid who was a wolf… and I pointed him to D’Aulaire’s toothy grey blobbish rendition of the Fenris-puppy. To which K helpfully added, See, Dad? She’s a wolf-mother! And now, so are you, K giggled at me. You’re a mom…with a wolf! Do you like it?, V asks. So I hope that you’ll think of me when you look at it, V said. And think of me too, blurted K, just wanting to be involved in the conversation. And things have been grumpy and difficult. This mother gets thrown to the wolves.